Management knows � if you are a corporation, then someday you�re likely to be sued or you�ll likely have to sue someone. Even absent pending litigation, protection, preservation and production of company data is not only mandatory, but with the implementation of new e-Discovery rules, failure to do so can subject you to civil as well as criminal liability. But what do you preserve, how long do you retain it, how much must you retrieve � and how do you retrieve it? 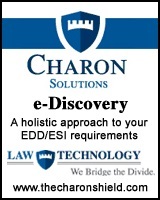 Charon Solutions untangles the web of confusion. We devise a plan specifically for Plaintiffs and Defendants � or corporations who simply want to be prepared in advance for any future litigation that may arise. We are also well versed in the new e-Discovery rules, so we can work with your IT and legal resources to assure that you will not run afoul of these rules. Fully 25% of attorneys in the United States believe that e-Discovery will be the most challenging legal issue of the next decade. Charon Solutions is ready � so you�ll be ready.